Zhongxi Wu was born in Heilongjiang Province in northeastern China, and is from a family of traditional musicians. His father and elder brother began teaching him reed instruments when he was eight years old. 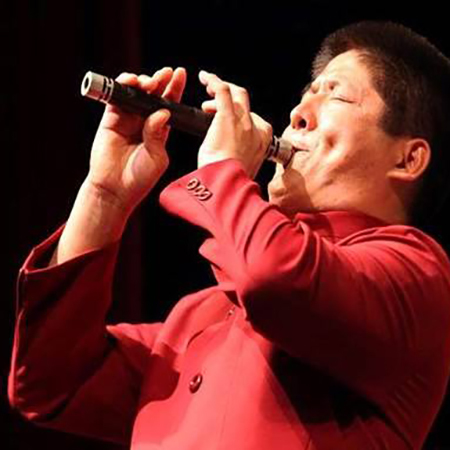 Zhongxi later graduated from the Heilongjiang College of Performing Arts, and has performed as a soloist in Japan, Hong Kong, and the many cities in the U.S.A. including New York, Washington D.C. He was a guest artist on the sheng at the Carrefour mondial de l’accordeon in Quebec in 2008. In 2012, he was appointed as a member of the China Nationalities Orchestra Society. As a resident of Vancouver, B.C., he has taught sheng, guanzi and suona, performed many solos and ensemble pieces, traditional and new music works, recorded CD’s with BCCMA and other groups, and performed at the Vancouver Jazz Festival. He has also learned to play the Scottish Highland Bagpipes and plays regularly with the Delta Police Pipe Band , with whom he has toured to England to perform for the Queen and will tour to Holland later this year. He has also arranged for East-Meets-West collaborations between suona and bagpipes. In 2014, he performed with the Seattle Symphony and the China Shenzhen Symphony in 2015, at the Benaroya Concert Hall in Seattle. In 2015, he performed the suona concerto “Lady Hua Mulan” with the B.C. Chinese Orchestra for their 20th anniversary tour, at the Chan Centre at UBC, Calgary’s Jack Singer Concert Hall, and Edmonton’s Winspear Centre. This year, he was also invited to teach suona, at the VSO Music School in Vancouver, as part of their new and unique Chinese Music Program. He contributed to the book, “Yueqi: Chinese Musical Instruments in Performance” by Alan R. Thrasher and Gloria N. Wong for the sections on sheng and suona.